Brownsi su smjehotres,i zvanicno su prvi koji su izgubili u bye weeku. 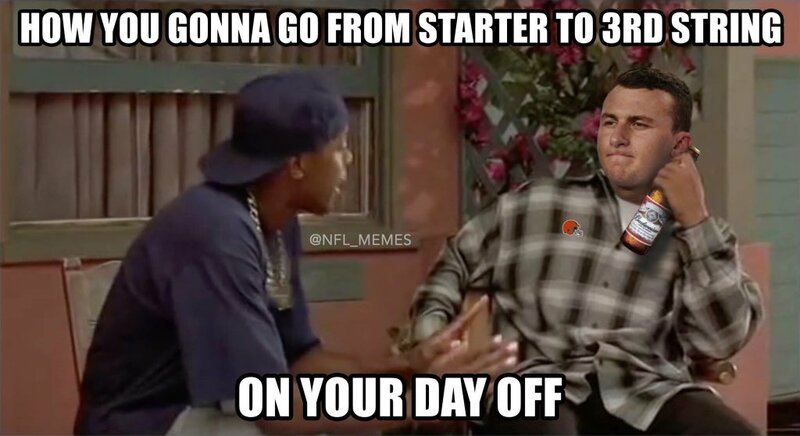 Johnny Manziel's latest benching lasted all of two weeks. Cleveland Browns head coach Mike Pettine announced Tuesday that Manziel will take over for Austin Davis as the team's starting quarterback for Sunday's game against the San Francisco 49ers. "Johnny will be our starting quarterback on Sunday," Pettine said. Fransiza koja 100 godina nije igrala plejof medjutim i dalje se ne nazire sezona u narednom desetljecu u kojem bi mogli do POa, uopste nema nikakve ideje, bas se brukaju iz sezone u sezonu, cak se ona prosla cinila da ima naznake pomeranja unapred ali onda ovakva sezona... Patos! Ja da sam sudija, imao bih razumevanja. Ipak dečko igra za Brownse. Johnny Manziel threw a pass to his right tackle. The tackle was penalized for illegal touching. Manziel flagged for intentional grounding. So there was that. We will give Manziel credit for this, though. He punctuated the Browns’ loss with the best helmet toss that franchise has seen since Dwayne Rudd. Dwayne Bowe was a healthy scratch again for the Browns. Finished year with five catches. And, oh yeah, $9 million guaranteed. @kb8 :: Dwayne Bowe was a healthy scratch again for the Browns. Finished year with five catches. And, oh yeah, $9 million guaranteed. Nikada mi neće biti jasno zašto se oko njega toliko diže prašina? Stalno je pod lupom kao da je najbolji QB lige ili šta već! The Cleveland Browns are staying in Ohio for their next head coach. The Browns are hiring Cincinnati Bengals offensive coordinator Hue Jackson as the successor to Mike Pettine, NFL Media columnist Micheal Silver reported Wednesday. Breaking News: Browns have been eliminated from Post Season contention.